The season may be over, but the real fight is just revving up. The Oakland A's are once again on the hunt for a place to build a new stadium, eyeing a Port of Oakland property adjacent to Jack London Square as a potential site and hoping to avoid the kind of community backlash that tanked the team's last bid. 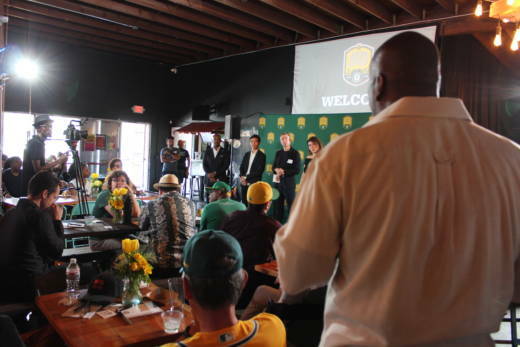 "The Laney experience was not managed great," said Taj Tashombe, A's vice president of external affairs, who hosted a community meeting on Sunday at a West Oakland restaurant near the proposed Howard Terminal site. "So I think that was a missed opportunity for everyone, for us, as well as the community to just have more opportunity to dialogue, like we're doing today." The team's plans to build a 35,000-seat ballpark near Laney College were derailed in December when the Peralta Community College District that owns the land abruptly pulled out of talks amid student and faculty resistance stemming from fears of heightened traffic and gentrification. Tashombe said the team is trying to do better on the community front this time around. Over a catered lunch, Tashombe and a crew of in-house planners offered community members a brief overview of their vision for a multi-use site. The plan is still light on details — something they referred to as the 'menu phase' — as they seek an exclusive negotiating agreement with the port (and separately with the city and county for the Coliseum location). Tashombe told the audience that any plan will include new affordable housing, retail sites and off-season attractions. Mostly though, the A's liaisons listened to resident concerns about the project, specifically inquiring about who really stood to benefit from it. One die-hard fan was worried about parking, while a neighborhood health advocate wanted to know what the team would do to help make a dent in the area's long-standing struggle with environmental pollution. In addition to the Howard site, the A's management said it's also considering redeveloping its current Oakland Coliseum site, which would include a new stadium and adjoining housing and retail spaces. The team said it hopes to announce its final plans by the end of this year and open the stadium for the 2023 season. Union contractor Nedar Bey told the panel he wanted to ensure that the project would utilize the local workforce, especially African-American and Latino residents. "I've lived in Oakland 40 years and I've seen this before," Bey said. "These are people that can do the work and deserve the work and they get left out." The A's, who have been searching for a new home for the last 25 years, will soon be the only remaining pro sports team in Oakland. The NBA's Warriors plan to be in San Francisco next fall, and the NFL's Raiders say they'll move to Las Vegas in 2020. The city and its fans are intent on keeping the team in the city. Following several years of dismal performance, the team drew renewed interest this season with the fourth-best record in Major League Baseball. But it's near the bottom of the league in terms of attendance drawing an average of 19,427 fans per game this season -- 26th out of 30 teams in the majors. There are hopes that a new venue will attract larger crowds and more revenue. "I think this is an intentional way to get that feedback from people, here, meeting people where they are," said Kieron Slaughter, who attended the community meeting Sunday and whose mom lives in Oakland. "This allows them to address it moving forward as they prepare their project." The next meeting about the Howard Terminal site is scheduled for Oct. 28 from 1-3 p.m. at Oakland City Hall.